New displays at the remodelled Derby station are keeping passengers fully informed and on the move. A 79-day project to upgrade the track, signalling and station layout at Derby station is now complete. One of the first stages of the work involved building a new 320-metre platform which includes two extra wide lifts up to the bridge above. Two new lifts have been included as the new platform does not have subway access as an alternative to the stairs. 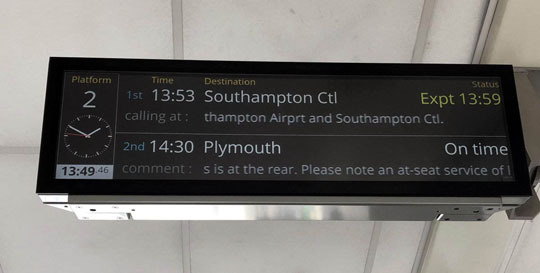 At the footbridge level of these lifts, landscape TFT displays by Infotec have been installed, keeping passengers fully informed and on the move. The new displays at Derby are the latest of hundreds provided to East Midlands Trains by Infotec, with others at stations in busy city locations such as Leicester, Nottingham and Sheffield as well as stations with lower footfall including Belper, Duffield, Ilkeston and Uttoxeter.